So I’m making new business cards and was looking for a catchy/witty job title…not that Baker is insufficient, I just think it’s a little lacking in the personality department. I looked it up on thesaurus.com and a synonym was “dough puncher”. How random a phrase is that?! I thought it was hilarious! It comes from the process of punching dough down during the rising process of bread making, but I didn’t know it was a title! I would love to put it on my business cards, but fear that it would confuse people. I told the owner of the bakery I work at, and he said people might get the wrong idea, maybe take offense. I think that’s stretching it, but whatever. My boyfriend thinks it sounds dirty. Of course his mind would go there…but, both are valid points, especially because a business card can be a client’s first impression of you. Should I care? Should I go for it cuz it’s a little bit funny and slightly dirty and has character? We’ll see. I’ve got a couple other ideas floating around so we’ll see what I land on. 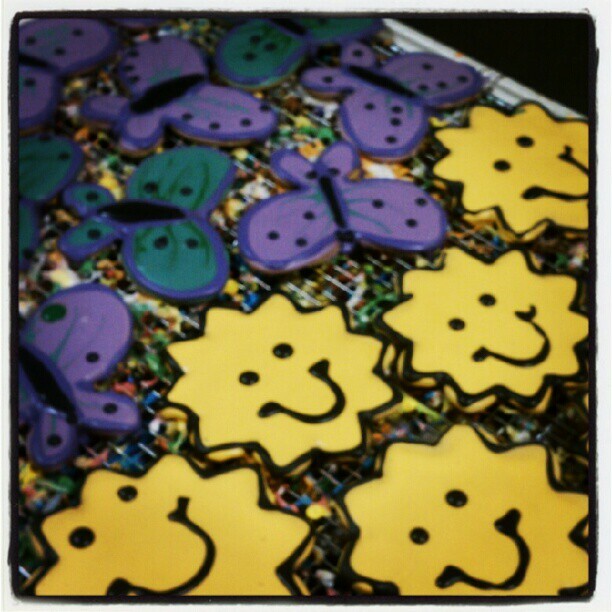 Posted in Uncategorized and tagged business cards, butterflies, cookie, dough puncher, royal icing, sugar cookies, suns. Bookmark the permalink.